I purchased 3 Runners for traffic areas in my Living Room and Hallway. They look great and are good quality. They are well worth the price i paid for them. I highly recommend these Runners. Old world elegance radiates from this Safavieh Mahal Collection rug, displaying dominant warm tones of rust, with small accents of blue, teal, beige, and sage green. This rug features various shapes surrounding a Heriz-inspired central medallion for added visual intrigue and symmetrical harmony. Simulating the classic Persian motifs that have graced refined rooms for centuries, this piece is an artful homage to traditional rugs. I've been using this rug for about 20 days. I choose to wait a while to see if I like it. So far, I think It's a solid nice rug. Not super long type which I think it would be easier to clean for living room purpose. It is thick enough that I could sit down and play with my cats on it. The color is a little faded not rich bright color style. So if you are looking for rich saturation rugs skip this one. This one looks great with darker brown furnitures and hard wood floor. I like the rug has some blue in it. So it's easier to match some blue decorations. Basically match the online information and pictures. For big one, still a little hard to imagine it. I've vacuumed once. It's very easy to vacume it. The one I ordered is 10 by 14, very hard to put on if you only have yourself. 2 people would be ok. I've moved around a couple times to find my best spot. My cats love it a lot. They can play and rolling around on top of it. Their paws are more comfortable to walk in the living room and they like to hang out more. For free shipping and the sale price, I think it's a good deal. The pattern doesn't make it looked like cheap rugs like just simple shapes or lines. And I like the pattern is not over complicated or over mordern style. We are looking for a in between style which works with this older house but not like living in the 1970's. 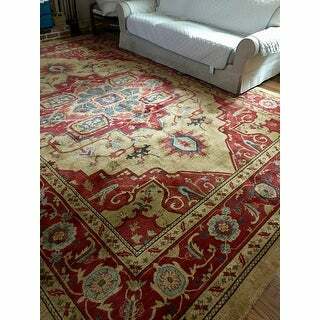 I absolutely love this Safavieh Mahal Traditional Grandeur Red/ Natural Rug! The colors are as pictured, very well made. I use it togetger with non-slip rug pad to add more thickness. Definitely would recommend. Love,love, this rug. Colors are nicer than pictured. The picture looks brick and tan but it's really a soft red , golden tan, and sky blue, turquoise blue and a teal blue. Beautiful colors ,there is a little bit of brown. I choose this for my cottage house that needed a pop of color as all the walls are wood and the floor is dark wood. The rug is very well made and dense. Looks like a high end wool rug but will be much easier to clean being polypropylene. Nobody believes what I paid for this. The design in the pattern is very detailed and blues are beautiful. This rug fit the bill for my husband who wanted red and me who wanted blues and yellow. 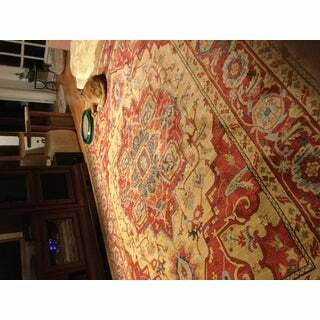 I have bought many rugs by this manufacturer ordered thru overstock I have never had a problem I highly recommend! Go for it! 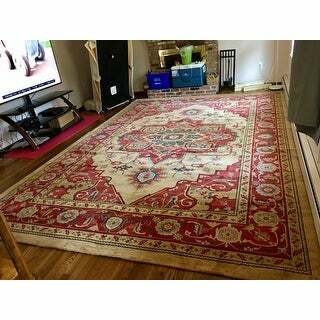 This is a beautiful rug for the price. The colors are accurately represented. Red, dark and light blue, dark and light brown, and a touch of pale green. This item was better than the photo, in my opinion. The colors were richer, the quality was very good, especially considering the price. I also would not have looked at this rug in a store and thought immediately "machine-made" as some rugs so obviously are. 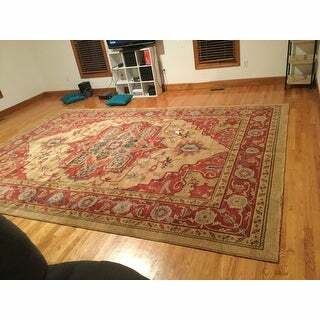 I would definitely recommend this item to anyone looking for this type of rug, and I would purchase it again myself. 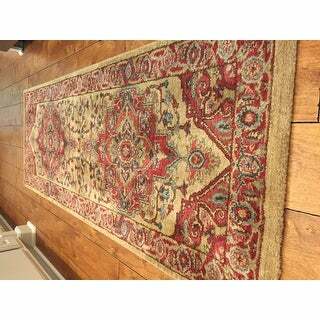 Love our Safavieh Mahal Traditional Grandeur Red/Natural rug...would definitely recommend it. I purchased the 5 X 8 and the 6'8" and I love them. To me the colors are closer to Brick Red, Camel, True Blue and a Light Blue, and a very small amouny of sage green (I am not a green person and I live these rugs). You will not regret buying these rugs, I didn't, and I am very very picky!! 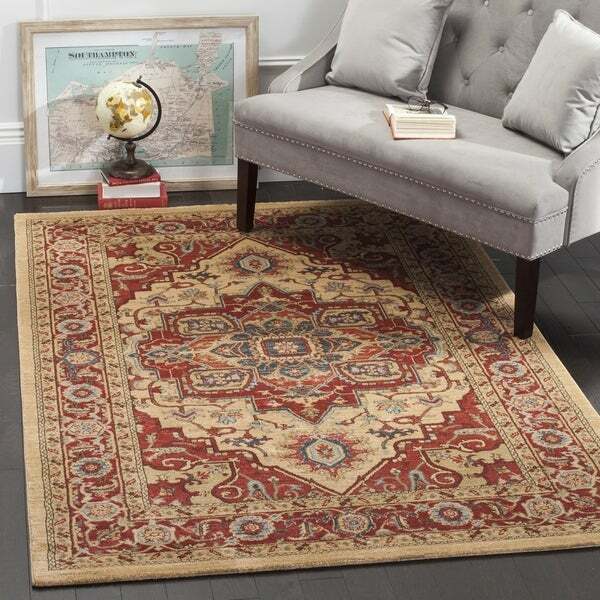 Hesitated ordering this rug because one of the main colors is red and I did not want a bright red rug. 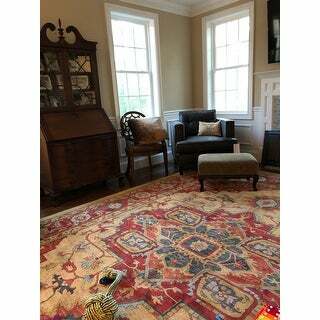 Was very happy upon receipt of the 2 rugs I ordered to see that the colors were muted pretty much like the photos they show. Perhaps it was the size of the rugs we ordered one 5' round rug and one 11' x 15' rug. I ordered a new couch that I'm waiting for to be delivered and am not worried because any one of the colors in the rug will complement the couch not overwhelm it. The rugs also lend themselves to any color you may choose to paint your walls be it a light muted shade or a bright vibrant color. As with the rug pads I ordered the rugs laid flat very quickly. We put them down late afternoon and they were pretty much laying flat the next day. 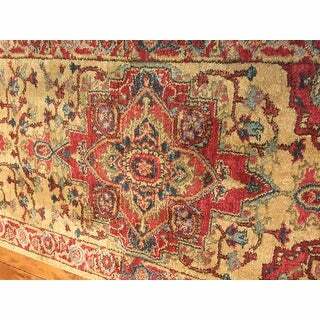 There was also very little chemical smell associated with a new rug purchase and it dissipated quickly. Overall I am very happy with the purchase and would purchase again. Disappointed with this purchase!!! 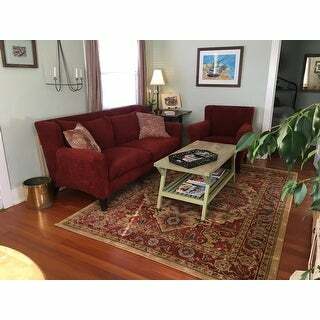 I purchased 3 of the 2’6” x 18’ Safavieh Mahal Traditional Grandeur Red runner rugs for my stairs because I believed by the photos and the comments of other customers and for obvious reasons from the title of this rug that this rug would have had more red in it and would look nice with my grey carpeting. I was expecting more of a soft red but it’s more gold and because of this it would not go well with my grey floors so I need to return this purchase. 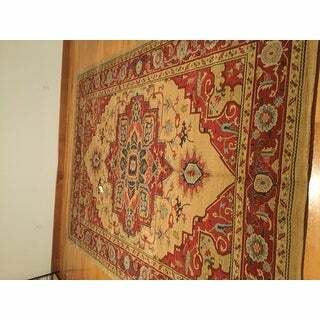 And not only is the rug not the main color I was looking for but it is also very thin but I will say though the rugs are soft and would probably keep the rugs just to avoid the hassle of returning them if they would have been the color as depicted in Overstocks photos online. I received the rug in the mail and I was happily surprised by the quality, size and price I paid for it! It fits perfectly in my living room and looks like I spent a lot more money on it than I actually did This was a bargain like no other. Even better than I had hoped for! Terrific quality, great price and lightening fast delivery! 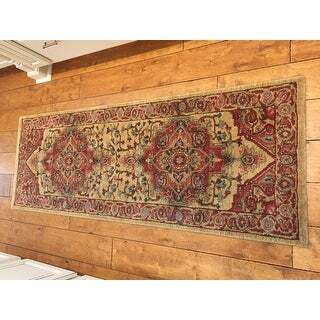 I get a lot of compliments on this rug - I bought it because I like the design and I didn't want to get anything too expensive since we have a one year old, a yorkie, and another (human) baby on the way. I didn't expect much but it looks really nice. the pile is short it is easy to clean so far (a few months now). The colors are muted and compliment the brown leather and cloth furniture in the room and hardwood floors. I love this rug!!! 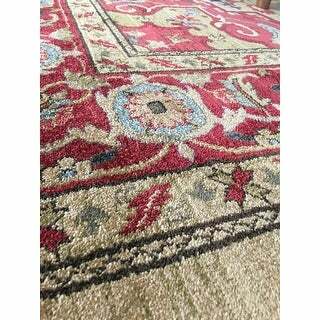 It looks beautiful and as pretty and as fine a quality as my Karistan rugs which I have. I am so pleased!! 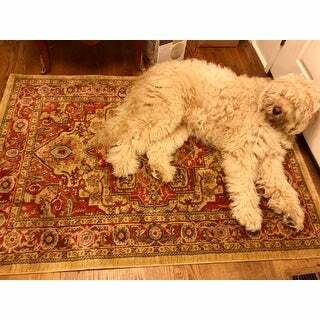 I’m sorry my golden doodle loves it too and I hated to have him move!!!!!! 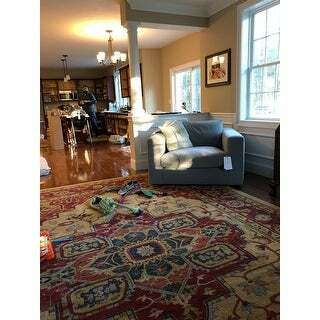 This rug went so well in the sunroom, it looked incredible! It reminds me of the one I had growing up in my parent's home. I purchased a smaller one, but i'm thinking of getting a bigger one in the future because it was so nice. It felt high quality, the colors really popped, and I didn't notice much of a smell as other had pointed out. Shipping also was super quick, and that was just great. 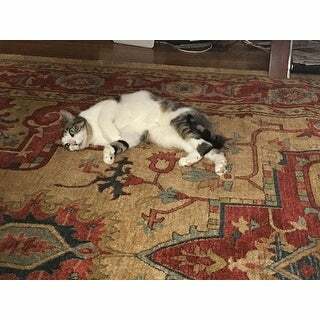 It's really soft, and my cat already claiming a spot on it as his.. haha I'm really satisfied with this rug, and hope to get it again soon! Lovely rug. Perfect for the small space I needed covered. Good value & price. Would recommend to purchase again. Love this drug. It's very classy, great feel add elegance to your room. Incredible rug. Larger sizes and small are beautiful. I am so happy. 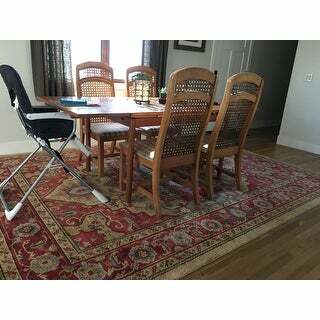 Nice rug at a great price. Attractive design. It does need the addition of a rug pad as it moves around without it. The trim color was a touch darker than expected. Quality was very good. Great rug for an office or small bedroom. The color is subtle but attractive. It wears well and is soft on your feet. You can roll an office chair on it with ease. Was the color in picture . Looks good and is perfect for the study. "What are the colors in this rug?" 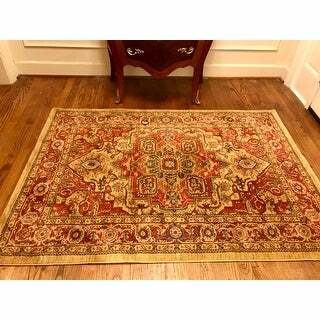 This rug has tones of bright brick reds, medium and light blues with natural beige colors. "When does this rug is going to be back again." "When vacuumed does dog hair easily get picked up?" Yes! I have an old Lab and I am very happy with the vacuuming and spill cleanup. "Does this rug come with a coordinating rug for my living room." "Does this rug come 9foot round?" Yes, please select the size in the product page. Absolutely no smell or shedding. The rug is as advertised. In fact it looks even better on the floor in my house than it did on the website. No shedding...smelled new for about a day maybe. "Does the runner rug go with the area rug? The colors look a little different"
They are a matching design and colorway. Occasionally, colors may vary a bit due to dye lot variation during production. The runner is darker than the rug. I didn't Mind it but it's not an exact matched set.